Speech after long silence, it is right . . . The silence here has stretched almost three months, the longest ever. It is hard to start again. I think I have to give explanations, detailed updates. The fact is there is no explanation apart from winter lethargy and my habitual procrastination. Opening the file and getting familiar again with the routine and the commands that place the words and pictures approximately where I want them is a lot like beginning to exercise again. My website muscles are as tight as those of my hips and thighs. But stretching them feels good, and I find they remember more than they have forgotten. So . . . According to the prompts I occasionally use from Judy Reeves’s A Writer’s Book of Days, Saturday’s suggestion was to “write about a year ago.” Not quite a year ago I wrote about my junior prom dancing queen. Last night was Lynn’s senior prom. Pictured below, right to left, are: Lynn’s best friend, McKenna; her date, Chris; Lynn’s boyfriend, Will (who is so tall he is accustomed to bending at the waist when he is photographed); and the smiling, glorious amazing Lynn. 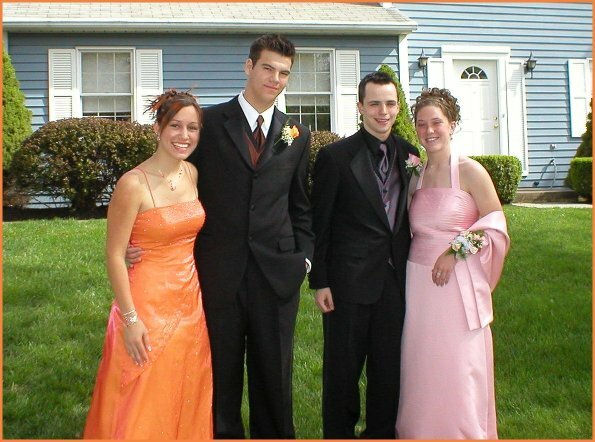 Last year I wrote that the junior prom was the beginning of a fifteen-month series of events leading to Lynn’s leaving for college. So far we’ve been through the last hockey game, the last candlelight chorus concert, and the last musical. Coming soon are the last spring chorus concert, the last spring band concert, the academic awards night, the sports awards night, and the graduation ceremony itself. The next day Lynn and McKenna are leaving for their two-week Excellent Adventure to Utah (where McKenna’s father lives and where she will go to college) and California. I’ll be in Massachusetts at a writing event for the second of those weeks. But the day after both of us get back we’ll have to go to Lynn’s new school, Millersville University, for family orientation. The forms for this event are downstairs bearing a May 1 deadline. I’ve opened this file, but I think I’ll let the picture take care of the thousand words. She’s dew, she’s gold, she’s eighteen years old, and I weep that she can’t stay that way while I can’t wait to see what comes next. This entry was posted in Lynn.